What is a Registered / Pedigreed Dog? Firstly you need to decide if you have the budget to purchase a well bred dog. Not everyone has the money to pay the full puppy price that breeders are asking for. There is a good reason we ask the prices we ask - you can read more about this on the Puppies page under the "Puppy Price Debate". The answer to this, I feel is simple....if you dont have the money to buy a pet that is properly bred, then you have only two choices: (a) SAVE the money (b) DONT buy a pet (c) ADOPT from a shelter. ALWAYS research the breed you are interested in. The media is at great fault for producing an "image" of what a Golden Retriever is and that is very far from what they actually are. Please read the information on the Puppies page about the characteristics of a Golden Retriever, why they are NOT suitable for everyone & if you are not familiar with the breed, please ask a breeder if you can visit their adult dogs. You will quickly see if a Golden Retriever adult is what you can live with!! ALL pedigree dogs should only be bred by someone that is familiar with the breed, their problems their health issues, knowledgeable about pedigrees (and what is behind each pedigree) and ONLY when all the health checks has been done. ALL purebred dogs suffer from genetic and hereditary problems due to the limited gene pool. There is simply NO compromise when it comes to health checks. We as committed, responsible breeders do everything we can to ONLY breed with healthy dogs - this should be your first and foremost consideration. A responsible breeder will ALWAYS be registered with KUSA. Ask for the breeder registration number and kennel affix details. All responsible and reputable breeders will have a kennel affix. If your breeder does not have an affix, its better to walk away. There is only ONE Registered and Pedigreed Golden Retriever and that is one that is REGISTERED with the Kennel Union of South Africa. NO other registering body is recognized to provide accurate pedigrees. SA Dog Breeders, K9 Registry, etc. - their pedigrees mean less than the paper they are written on. Insist on seeing the pedigrees of BOTH parents and make sure that they are KUSA Registered. If they are NOT KUSA Registered, they are simply not registered nor pedigreed. Goldens, like most large breed dogs, are predisposed to Hip and Elbow Dysplasia. There are 3 roll players in this disease; Genetics, Environment and Nutrition. To minimise the risk of producing puppies with Hip Dysplasia, reputable breeders have their breeding stock's hips and elbows X-rayed once they reach adulthood (at 12 - 18 months of age). These X-rays are examined and scored by a radiologist. Only dogs with acceptable scores are then bred from. Unfortunately there is room for error as this is not a genetic test but merely states that the specific dog is free from radiographical changes. This does not mean that the dog is genetically free from Hip or Elbow Dysplasia merely that the dog shows no sign of the disease. At this stage there is no genetic test available for Hip or Elbow Dysplasia. Environment and how the puppy is raised plays a hugely important part in whether a puppy will develop Hip and Elbow Dysplasia or not. Jumping over obstacles, in and out of cars, slipping on floors, over-exercising can all lead to a puppy developing these problems. It is therefore essential that you are cautious with a puppy's activities until it is at least 12 months old. If your puppy has an accident at this stage (like falling off something) they probably will develop a joint problem. On the other hand, Hip Dysplasia is by no means a death sentence and most Goldens with this problem cope extremely well into old age. In this day and age there are also many ways of maintaining a dog with joint problems, such as nutrition. Nutrition is the other and most controllable variable in this equation. With a large breed dog one has to prevent the puppy from growing too fast and this can be done through nutrition. We feed Hill's Science Plan Large Breed Puppy, Eukanuba, Royal Canin, Origin or Acana to our puppies and insist that our owners do the same. One of the most detrimental factors for Hip Dysplasia is an overweight puppy or dog. It has been proved that dogs that are overweight are 50% more likely to develop Hip Dysplasia than their littermates at ideal weight. 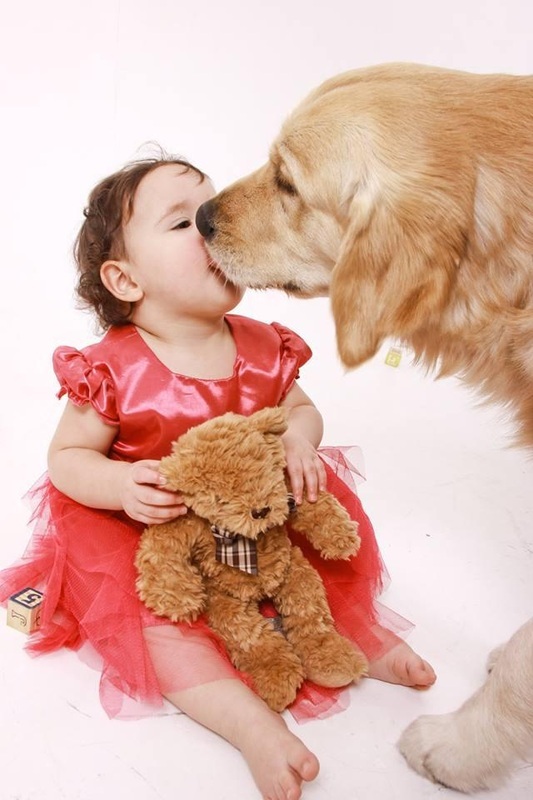 Goldens, once again like many other breeds, are predisposed to many eye diseases as well. To avoid producing puppies with problems, reputable breeders have their breeding stock screened annually. Once again, these certificates only state that the dog in contention does not have the disease/s at the time of the screening. Unfortunately there are as yet no genetic tests available for eye diseases in Golden Retrievers (some other breeds such as Labrador Retrievers, have DNA tests available for some of the eye diseases. Although these certificates cannot assure one of never producing an affected puppy, at least by testing, reputable breeders are not breeding with affected dogs and therefore minimising the risk of producing affected puppies. Pedigree of parents should be available for you to evaluate. Ask about the COI (Coefficient of Inbreeding) of the parents. Ask to see both parents - if the stud dog is not on the premises, ask to see photos of the stud dog. Ask the age of the parents - the dam should not be younger than 2 years or older than 6 years. Both parents to be KUSA Registered (no other registering body is accepted). Ask for a copy of the Puppy Sale Agreement / Contract. Ask about show achievements, show results of the parents - if a breeder does not actively show their dogs, they are not taking their breeding seriously because the main purpose of showing is to evaluate if your breeding dogs adhere to the breed standard. Ask the breeder why they combined these particular parents - they should be able to tell you points regarding the conformation of each dog, their COI compatibility as well as their pedigree compatibility. Check out the puppies' living quarters. Are they scrupulously clean? Is the breeder making provision for proper socialization of the litter? Is there Breeding Restrictions in place for the puppies? Reputable breeders will always sell their puppies with breeding restrictions. When visiting the puppies - are the puppies happy and out-going, with clear eyes and skin? Reputable breeders screen their owners carefully, don't feel offended if they ask what seems like personal questions. Remember that you would like to purchase your puppy from someone that is concerned with the future of any puppy that they sell. This process more than likely will involve an interview. Most reputable breeders are involved with their dogs in some sort of competition, whether it be showing, working, obedience etc. Temperament Assessments should be done on the entire litter to ensure matching the correct puppy to the correct home.